CAREER HIGHLIGHTS: Started as PSA CEO on March 31, 2014. Prior to that he spent 32 years at Renault and Nissan, rising to Renault chief operating officer in 2011. He stepped down as COO in August 2013 soon after saying in an interview that he wanted to become CEO at an automaker. REASON FOR WINNING: The hobby racecar driver likes to move fast. He needed less than a year as CEO to guide PSA's auto division to its first operating profit in five years, during which time the company lost a combined 7 billion euros. 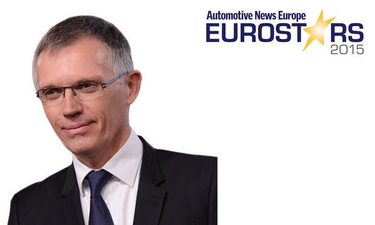 The momentum carried into 2015 as PSA's auto unit made a 975 million euro operating profit in the first half, resulting in an operating margin of 5 percent, well ahead of Tavares' goal of delivering at least" a 2 percent margin by 2018."